Fall is here. For some, this fall is especially exciting because it marks their freshman year of college. First of all, congratulations! It took a lot of work to make it to college. You are one step closer to an amazing future. Although you’ve worked hard to make it to your institution, it’s going to take even more work to get out of there with your degree. In the first couple weeks of college, your advisors and RAs will bombard you with colorful orientation packets. The packets will tell you how to use the college’s libraries, gyms, and dining halls, but the packets won’t warn you about the racism you might face on campus. I’ll tell you the same wise words that I was told my second year in college. “You are a black-eyed pea in a sea of grits”. People might not like you because of the color of your skin. 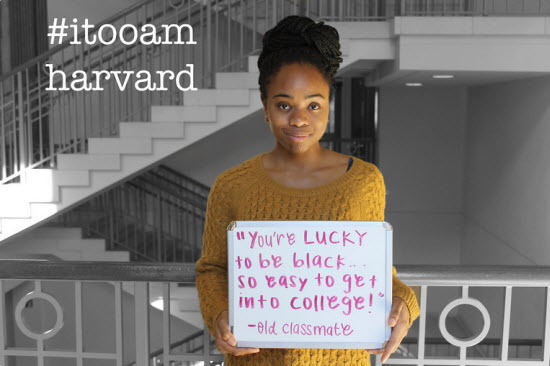 Others will think that the only reason why you’re in college is because you’re Black. Oh and people might try to date or hook-up with you just because you’re a Black woman. Be prepared! The list of the possible forms of racism can go on and on. If it’s not the blatant racism, then it’s the hipster racism. Since person A has Black friend and listens to Kanye West, then person A can be as racist as possible and it doesn’t matter. It’s a fault in logic that you might hear from several liberal students on campus. When you’re trying to decide who will be a part of your squad, be careful. Just because they blast Kendrick Lamar’s new album and say that Beyoncé is their spirit animal, doesn’t mean that they have good intentions. In college, friendships are important. They can help you get free meal swipes, but more importantly, when you’re having a crisis or a struggling with your classes, your friends are there to support you. College will be hard. Tomfoolery, which you’ve never seen before, will start appearing in every corner. You’re true friends will stand by your side and help you fight off the discrimination that’s prevalent on campus. You’ve earned your spot to be at your university, and now it’s time to earn your degree. If any of you have faced discrimination while in college, how did your friends help you through it? Next Post What Makes You Black?